Of the many types of beds available, divan beds are the most popular. Divan beds are very adaptable and can be used in almost all these situations. They are ideal for small bedrooms or for the most luxurious of bedrooms. They also have one very big advantage over other types of beds, in that they nearly always include extra storage space built into the base of the bed, making excellent use of all the space in the bedroom. Divan beds are made from a wooden box construction and covered with fabric, it could also include a sprung base which will give the mattress extra support and comfort. These types of bases are generally found in the more expensive Divans. Built into the sides of the divan are storage drawers. In single beds there are usually two but in double beds the four storage drawers are found two on each side. When looking at the storage drawers it is well worth considering to choose ones that are designed with smaller drawers at the head of the bed. This will allow them to be opened even if there are bedside tables adjacent to the bed head. Some Divan beds have the facility of being able to lift the complete base of the bed, this making the whole of the underneath of the bed available for storage. The Burnham divan bed has a 13.5 gauge spring system encased in a 8 gauge frame to give great stabil.. The Deluxe Orthocare divan set (Mattress & Base) has a 9 inch (23cm) micro quiolted Open Coil ma.. The Wentworth divan bed incorporates an Open Coil Spring finished in a micro quilted hard wearing pa.. The Waterproof divan set (Mattress & Base) has an 7 inch (18cm) Open Coil mattress wit.. The Woking divan set (mattress & base) incorporates a 12.5 gauge Open Coil Spring mattress .. 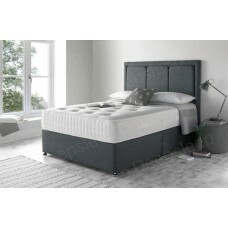 The Banbury divan set (Mattress & Base) has a 10 inch (25cm) hand tufted Open Coil mattress with.. The Denham divan set (Mattress & Base) has a state-of-the-art temperature responsive, slow recov.. The Visco Comfort divan bed contains an open coil spring system plus a top layer of memory foam whic.. The Harewood 1000 Divan set (Mattress & Base) has a 9" (23cm) deep micro quilted 1000 pocke.. The Chesham divan set (Mattress & Base) has a state-of-the-art temperature responsive, slow reco.. The Buckingham 1000 Divan set (Mattress & Base) has a 9" (23cm) deep hand tufted, 1000 pocket sp.. The Fulmer 1000 pocket sprung mattress is dual season with a layer of memory foam on the w.. 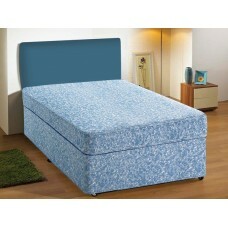 The Pisa 1000 Divan Set (Mattress & Base) has a 9 inch (23cm) deep hand tufted 1000 Pocket Sprun.. The Tuscany 1000 divan bed has a pocket sprung system which provides excellent comfort and support. .. The Ortho Pocket 1000 divan bed (Mattress & Base) has a 1000 Pocket Sprung mattress which featur.. The Sleepeezee Backcare 800 divan bed (Mattress & Base) has a 800 Pocket Sprung mattress which f.. The Silentnight Sterling Miracoil divan set (Mattress & Base) has a Miracoil 3 spring system mat.. The Bray 1500 divan bed (Mattress & Base) has a 1500 Pocket Sprung mattress which features a han.. The Comfort 1000 Divan Set (Mattress & Base) has a dual season mattress with the .. The Sleepeezee Memory 800 Divan Set (Mattress & Base) has a 9 inch (23cm) deep micro quilted 800.. The Sleepeezee Backcare 1000 divan bed (Mattress & Base) has an 1000 Pocket Sprung mattress whic.. 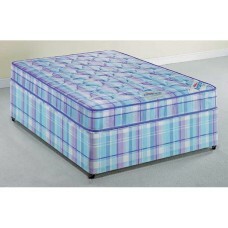 The Rest Assured Pocket Memory 800 divan bed (Mattress & Base) has a 800 pocket sprung mattress .. The Sealy Posture Ruby divan bed (Mattress & Base) has a weight responsive Sealy Posture Tech sp.. The Visco Fusion divan set (Mattress & Base) contains 100mm (4") of V50 and V60 state-of-th.. The Myers Pocket 1000 divan bed (Mattress & Base) contains 1000 pocket springs for&nbs.. The Sealy Posture Ortho divan bed (Mattress & Base) has a Posturepedic Zero Deflection Spring Sy.. The Sealy Posture Memory Divan Set (Mattress & Base) has a 9 inch (23cm) deep mattress topped wi.. The Sleepeezee Memory 1000 Divan Set (Mattress & Base) has a 10 inch (25cm) deep micro quilted 1.. The Sleepeezee Backcare 1400 divan bed (Mattress & Base) has a 1400 Pocket Sprung mattress which.. The Myers Memory 1400 divan bed (Mattress & Base) has a 1200 pocket sprung mattress which provid.. The Sleepeezee Gel 1000 divan bed (Mattress & Base) has a 1000 pocket spring mattress with filli.. The Sleepeezee Memory 2000 Divan Set (Mattress & Base) has a 9 inch (23cm) deep micro quilt.. The Silentnight Pocket 1400 divan bed (Mattress & Base) has a Mirapocket sprung system which pro.. The Sleepeezee Ortho Pocket 2000 divan bed (Mattress & Base) contains 2000 pocket springs w.. The Hypnos 7-Turn Pocket Sprung divan bed (mattress & base) is handmade using naturall.. The Hypnos 8-Turn Pocket Sprung divan bed (mattress & base) is handmade using naturall.. The Hypnos 9-Turn Pocket Sprung divan bed (mattress & base) is handmade using naturall.. 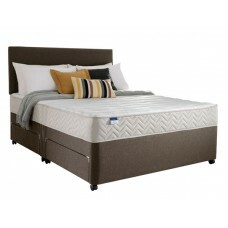 The Harrison Pocket 6700 divan bed (mattress & base) is handmade using the finest natural fillin.. The Harrison Pocket 8700 divan bed (mattress & base) is handmade using the finest natural fillin.. The Harrison Pocket 10700 divan bed (mattress & base) is handmade using the finest natural filli..